To heighten public awareness of the commonwealth’s many exceptional trails, the Pennsylvania Trails Advisory Committee designates an annual ‘Trail of the Year’ aimed at building excitement, enthusiasm and support for our trails, small and large. This year, the Mid State Trail (MST), Pennsylvania’s longest, most remote and wildest footpath has been named ‘Pennsylvania’s 2019 Trail of the Year’. The MST, celebrating its 50th anniversary this year, was the first trail in the United States to use metric measure (kilometers) and is still one of the few to do so today. The 527 km, 327-mile-long trail bisects the state, cutting through the Dark Skies, Pine Creek Valley & PA Grand Canyon, and I-80 Frontier landscapes of the Pennsylvania Wilds, across Tioga, Clinton, Lycoming and Centre counties. The trail continues south all the way to the Maryland border. The vastness of the MST necessitates that it be divided among four management regions, from north to south, Tioga, Woolrich, State College and Everett. The 527 km, 327-mile-long trail bisects Pennsylvania, cutting through the PA Wilds Dark Skies, Pine Creek Valley & PA Grand Canyon, and I-80 Frontier landscapes of the Pennsylvania Wilds, north of State College. The MST in the PA Wilds begins at the New York border in the Tioga (County) Region, traveling through Cowanesque Lake, Tioga-Hammond Lakes, Hills Creek State Parks, then crossing PA Route 6 midway between Wellsboro and Mansfield. The trail then continues southwest through Antrim, Morris and Blackwell before leaving Tioga County and entering northwest Lycoming County. Stretching south in the PA Wilds, the MST in the Woolrich Region continues through Lycoming and Clinton counties, passing through Little Pine and Ravensburg State Parks. As the trail exits the PA Wilds, trail users enter R.B. Winter State Park. The State College Region is next on the trail, and the Everett Region takes the MST into Maryland. 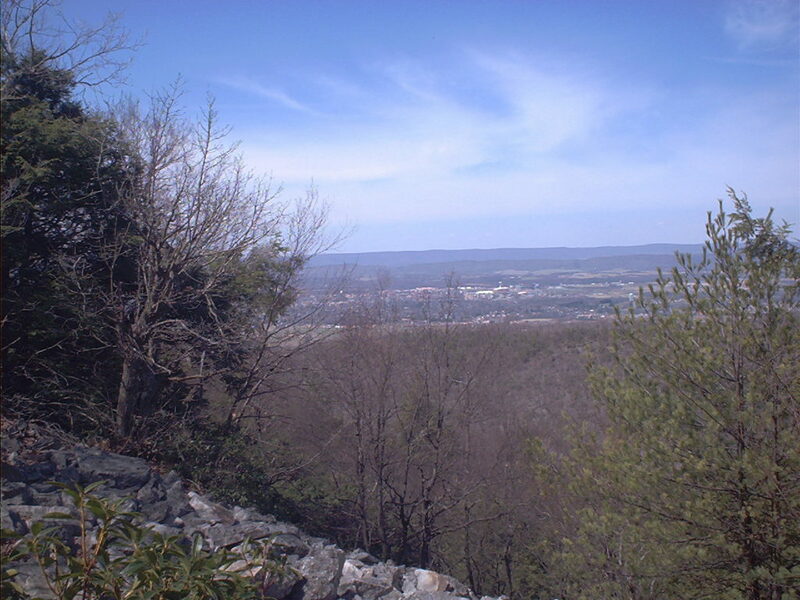 View of State College from the Mid State Trail. Courtesy of the Mid State Trail Association. From New York state to Maryland, the MST passes through eight state forests, eight state forest Natural Areas, four state forest Wild Areas, four state forest picnic areas, two Scout camps and one roadside rest. The Mid State Trails are marked with single rectangle orange blazes and two rectangles to denote turns, of which there are many. 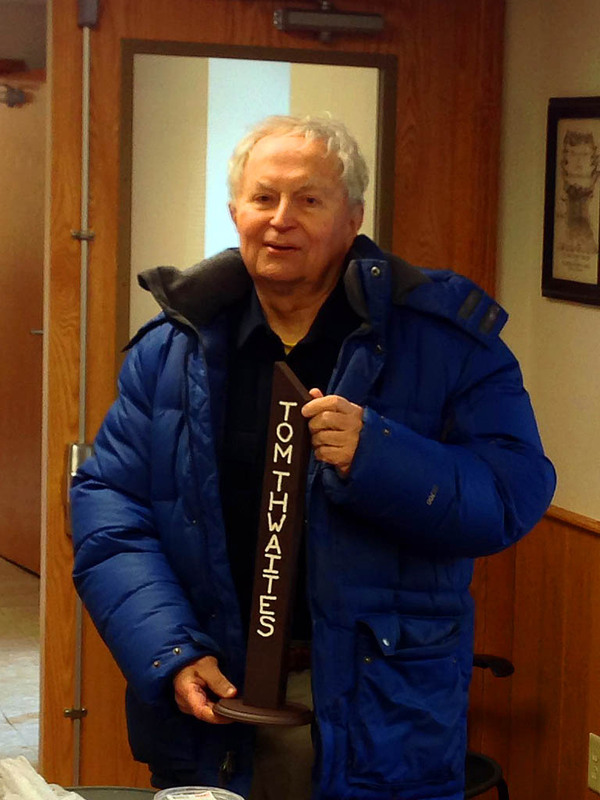 Dr. Thwaites passed away on Christmas Day, 2014 at the age of 83. 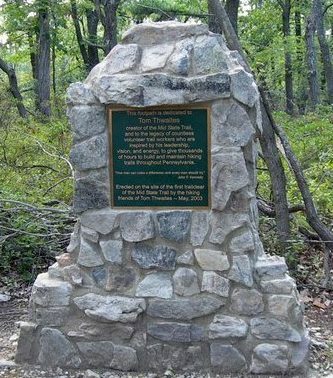 A monument to his dedication and hard work is stationed along the trail where the first trailblaze was struck. In 1982, the Mid State Trail Association was formed to guide the Mid State Trail’s growth and protect its future. The association engages many local volunteers who construct and maintain the footpaths through some of the most beautiful natural landscapes in the nation. With so much territory to cover, Trail Association President Ed Lawrence says it couldn’t be done without the help and efforts of so many hard-working people. 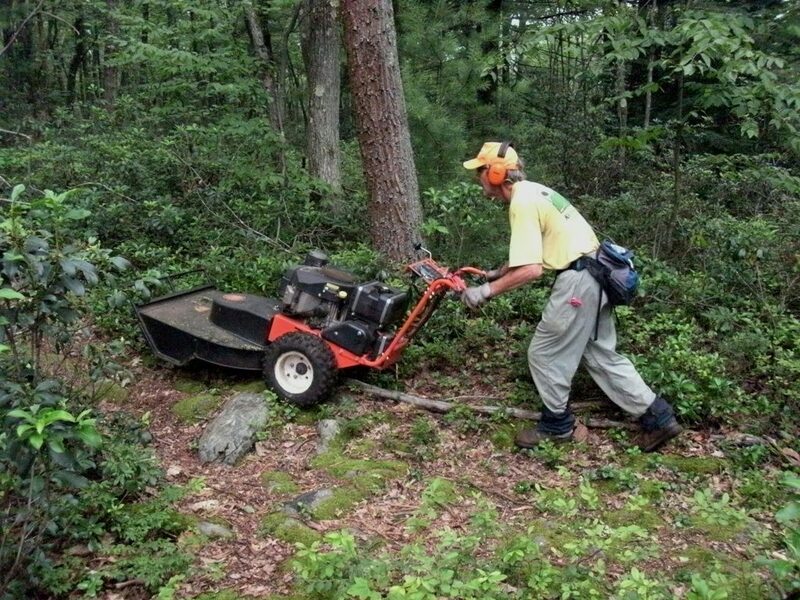 Mid State Trail President Ed Lawrence clears the trail north of R.B. Winter State Park. Photo courtesy of Joe Rebar. ‘til I rest my soul on Big Flat with a bear to share the view. Let me go to hiker’s heaven at the ending of my tale. A retired radio and TV newscaster, newspaper writer and corporate communications/media relations manager, Ed Byers is past President of the Associated Press Radio-TV Broadcasters Association and The Press Club of Cleveland. He resides in Forest County, in the nearby Allegheny National Forest.